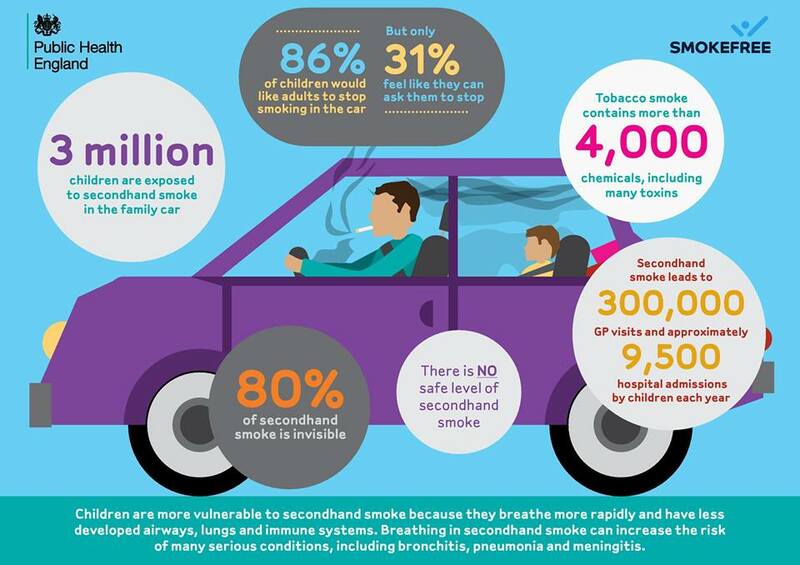 Public Health England – supported by Kent County Council – has launched a campaign to highlight the hidden damage that secondhand smoke can cause to children’s health, following the government’s decision to end smoking in cars carrying children. Smoking prevalence in Kent is higher than the national average and is even higher among certain ethnic groups, pregnant women and routine and manual workers. It is estimated that there are around 240,000 smokers in Kent and that smoking costs the county around £406million every year, including the £49million in direct costs to the NHS and £19.5million in social care costs. KCC Cabinet Member for Adult Social Care and Public Health, Graham Gibbens said: “We thoroughly support this law and the campaign to raise awareness as we consider it an important initiative that will bring considerable health benefits, in particular to young people. The government estimates that three million children in England are exposed to secondhand smoke in their family car, which puts them at risk of serious conditions including, respiratory infections, meningitis and triggering asthma. A survey by the British Lung Foundation found that 86% of children who are exposed to smoking in cars would like the smoker to stop; yet only 31% actually feel able to ask them to do so. 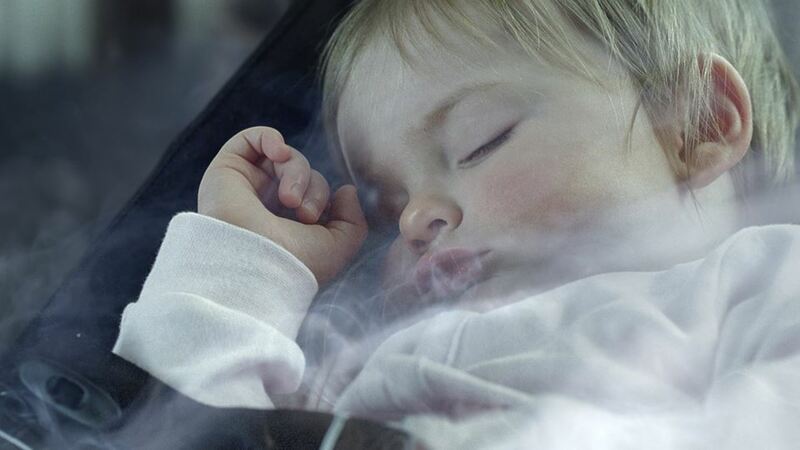 Professor Dame Sally Davies, Chief Medical Officer said: “The passing of regulation to make smoking in cars carrying under 18s illegal is a significant victory for protecting children’s health from secondhand smoke. “Smoking just a single cigarette in a car exposes children to high levels of air pollutants and cancer causing chemicals like arsenic, formaldehyde and tar. The government and public health professionals see this vote as a significant milestone in protecting children from the health risks of secondhand smoke. The law will come into force on 1 October 2015, and people failing to comply could face a £50 fixed penalty notice. Secondhand smoke is particularly harmful to children as they breathe more rapidly and have less well-developed airways. Dr Penny Woods, Chief Executive of the British Lung Foundation, said: “After years of campaigning on this issue, we could not be more delighted by the government’s commitment to help stop smoking in cars with children present. The Smokefree Homes and Cars campaign features advertising on TV, radio and online from 9 February 2015. It highlights that many parents are often unaware of the damage smoking in the home and car causes to children’s health, and encourages them to quit. Smokers can search ‘smokefree’ or visit nhs.uk/smokefree for a range of free support and quitting advice, including the Smokefree app and Quit Kit. 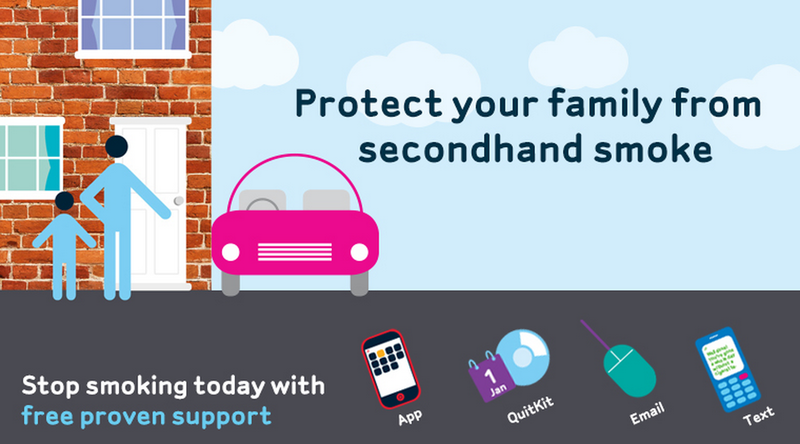 Did you know around 3 million children in England are exposed to secondhand smoke in their family car? Try quitting with our free help and support. Just search ‘Smokefree’ online. February 12, 2015 in Health and Wellbeing, Media Releases.